Home / Bluetooth / TAGG / TAGG LOOP / "LOOP" Portable Bluetooth Speaker by TAGG. We bet you'll go WOW! "LOOP" Portable Bluetooth Speaker by TAGG. We bet you'll go WOW! 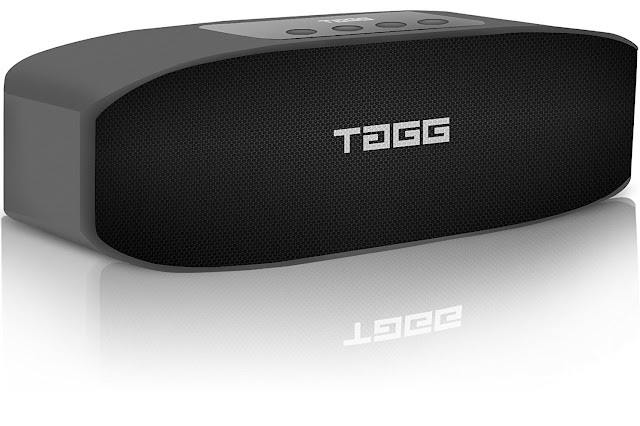 TAGG now introduce the much awaited TAGG LOOP Portable Bluetooth Speaker to you. Designed for sleek simplicity to complement your lifestyle, with TAGG LOOP you can take you favorite tunes everywhere and listen to it all day long. Lightweight, portable and most of all it flaunts a compact design with a powerful sound. You can pack it in your bag or carry along. Order it, Zit it and it with you. Armed with powerful sound technology that delivers high quality audio and a sleek design, TAGG LOOP wireless Bluetooth speakers are an ideal pick for all music lovers. This comes with an effective Bluetooth feature that offers seamless connection without any need of wires. Refined build highlights its ergonomic controls and smooth curves that provides strength and makes it highly durable. With TAGG LOOP, you can experience louder sound beats without any compromise in the sound quality and well-balanced audio. This also comes with Built-in speakerphone that allows you to answer calls and offers clear sound without any distortion. TAGG LOOP Bluetooth speaker render an amazing listening experience while taking up very little space. TAGG LOOP is small and light enough to tuck into your bag. Weighs in at just 0.5 kg, its low profile lets you place it almost anywhere and provides a low center of gravity that makes it nearly impossible to tip over. You don't have to sacrifice performance for portability. Created to compliment your outdoor lifestyle, with TAGG LOOP you can take your favorite tunes everywhere and listen to it all day long. It’s lightweight, portable and most of all flaunts a compact design with a powerful sound. You can pack it in your bag or carry it in your hand just like water bottle effortlessly and move with ease.Never worry about a long journey. Enjoy up to 4-5 hours of continuous music. Thanks to the 2,400 mAh rechargeable lithium-ion battery. The convenience of being able to charge from most USB power sources adds onto its advantages.Zip it and take it with you. TAGG LOOP is designed for sleek simplicity to complement your lifestyle. Refined build highlights its ergonomic controls and smooth curves that provides strength and makes it highly durable. With TAGG LOOP, you can experience louder sound beats without any compromise in the sound quality and well-balanced audio. This also comes with Built-in speakerphone that allows you to answer calls and offers clear sound without any distortion. Customized dual drivers produce 16 W of huge stereo sound. A Digital Signal Processor with dynamic range control ensures high volumes are distortion-free and low levels produce rich bass. Bluetooth 4.0 provides the features seamless connectivity, stable signal transmission, clearer sound quality and low power consumption. Distortion-free at maximum volume; room filling sound, perfect for home, dorm room, parties; streaming music or internet radio services. Connect in just a few seconds over Bluetooth to your iPhone, Smartphone, and Tablet Play from Chromebooks, Windows 7-8 systems, TVs and other non-Bluetooth devices one can use 3.5 mm jack to get connected with the speaker. TF card and USB is also supported. Stylish & Portable: Under 15 ounces, 8 inches long and 2.3 inches tall, ultra-compact TAGG LOOP Bluetooth speaker can easily be slipped into your bag-pack or bag. Whether you' re lounging around the house or doing outdoor activities, take your perfect companion "LOOP" with you anytime, anywhere. Built to complement your lifestyle. 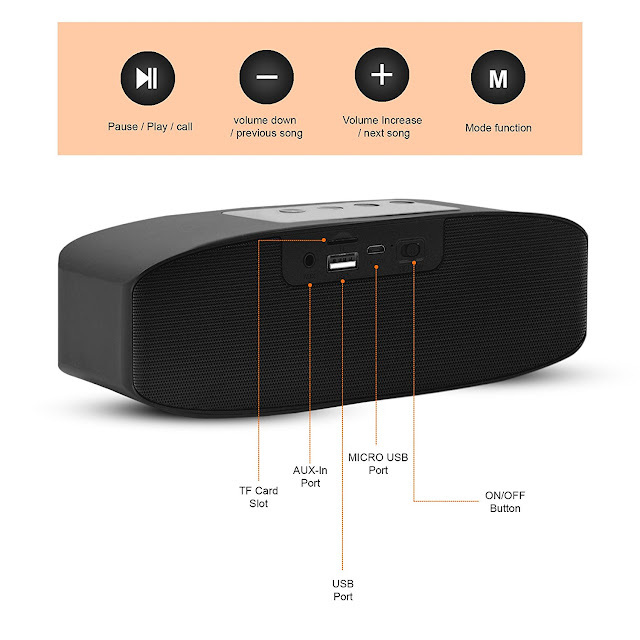 Compatibility: Equipped with smart Bluetooth 4.0 technology which features stable signal transmission, TAGG LOOP Bluetooth speaker is compatible with all Bluetooth enabled devices. For other non Bluetooth devices, one can use 3.5 mm jack to get connected with the speaker. TF card and USB is also supported. Long Music Play Time: Long Playtime: Built-in Li-Ion 2400mAh rechargeable battery guarantees up to 4-5 hours playtime and upt 18 hours of talktime. Recharge in just 2 hours with included micro USB cable. What you Get: TAGG LOOP Bluetooth speaker, Micro USB charging cable, AUX-in Cable, welcome guide, our worry-free 12-month warranty and friendly customer service.